Up to 5 Irish children and teenagers are diagnosed each week with Type 1 diabetes. Type 1 diabetes is an autoimmune condition affecting 1 in 500 children with onset over days or weeks. The condition tends to occur in childhood or early adult life and will require daily insulin therapy. It is caused by the body’s own immune system destroying the insulin-making cells (beta-cells) of the pancreas. A simple finger prick test by a GP can lead to early diagnosis and avoid the risk of developing DKA. Early diagnosis is vital to ensure that Diabetic ketoacidosis (DKA) does not develop. DKA is a potentially life threatening condition that requires urgent medical attention. In 2014, 1 in 6 children diagnosed with Type 1 diabetes were admitted to hospital with DKA, as a result of late diagnosis. 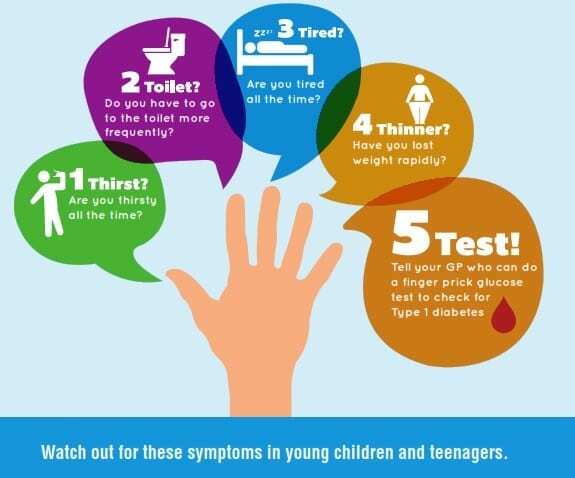 Knowing the symptoms of Type 1 diabetes is vital. Up to five children and teenagers are diagnosed each week with Type 1 diabetes in Ireland with 10% having a late diagnosis resulting in critical illness. Thirst: Excess drinking, unable to quench thirst. Toilet: Frequent urination, particularly at night. Tiredness: Lack of energy, sleeping more than usual. Weight loss: Rapid weight loss over a short period. If these symptoms present themselves, immediate attention is needed. A simple blood glucose (finger prick) test by your GP can check for Type 1 diabetes. In children under the age of two, symptoms may not be immediately obvious. If your child is unwell without a definite cause, ask your GP to check for Type 1 diabetes. For more information on Type 1 Diabetes and early diagnosis please download our Type 1 Diabetes; Know the Warning Signs leaflet. Type 1 and Type 2 diabetes are two very different conditions. For more information on the difference between Type 1 and Type 2 diabetes please click here.